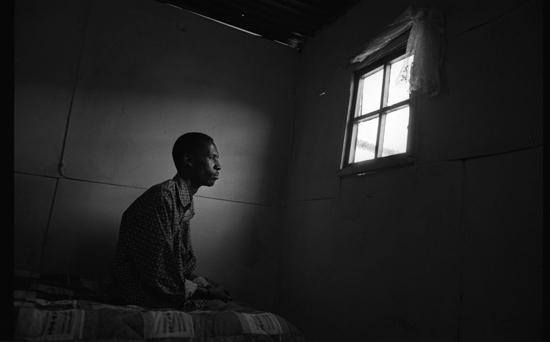 A young man receives treatment for HIV at MSF's project in Khayelitsha. shortcomings, of these efforts in the course of providing care and treatment in more than 30 countries. Today, the good news is that four million HIV-positive people are alive on antiretroviral therapy (ART). The bad news is that MSF teams working to treat HIV/AIDS are witnessing worrying signs of waning international support to combat HIV/AIDS. In some high-burden countries, patients are being turned away from clinics, and clinicians are once again being forced into the unacceptable position of rationing life-saving treatment. At the same time, more robust and better-tolerated treatments–widely prescribed in wealthy countries–are not reaching patients. There are signs of a decreasing political commitment to HIV/AIDS, the loudest being a major funding deficit. Critical funding from the Global Fund to Fight AIDS, Tuberculosis and Malaria and the US President’s Emergency Plan for AIDS Relief (PEPFAR) are in peril. resources to an array of global health priorities, not least maternal and child health, cutting HIV/AIDS funding is not the answer. Reducing funding at this juncture would not only undermine the goal of reducing maternal and child mortality, but it could also lead to the interruption of treatment for people with HIV/AIDS already on ART, and leave those still in need of access to treatment to die premature, avoidable deaths. This killer disease is an ongoing emergency that requires dedicated resources at the national and international levels. A strengthened commitment to other global health priorities must happen–but it must happen in addition to, not instead of, a continued and increasing commitment to HIV/AIDS.